Last weekend the Lady Bears traveled to Ankeny, Iowa for the Midwest Christian College Conference tournament. Even though the weekend didn’t go as the Bears had hoped after going 4-5 in conference play, freshmen Leilani Carrasco (Eaton, Colo.) was rewarded as a MCCC All-Conference performer. The Bears came into the tournament as the #4 seed, and they would open tournament play against the #5 Calvary University (Belton, Mo.). In the previous two contests, the home team in each game came away victorious. The Warriors got off to a hot start, and they outscored the Bears 21-2 in the first quarter. Although the Bears would continue to fight and even outscore the Warriors in the other three quarters, the Warriors defeated the Bears 58-44. On Friday morning, the Bears would play in the consolation bracket against #8 Ozark Christian College (Joplin, Mo.) for the third time this year. In the previous two match-ups, the Bears came away with the win. The evenly matched teams would trade leads several times in the first quarter. The second quarter would prove to be the difference in the game, Ozark outscored Barclay 16-5 in the quarter. The Ambassadors’ zone defense gave the Bears problems the entire game as they forced the Bears into an excessive amount of turnovers and 25% shooting from the field. Barclay would go on to lose the game 62-44. Junior Mycha Owens (Cullison, Kans.) led the Bears with 21 points and 13 rebounds. Friday night, the MCCC honored the top players in the conference. 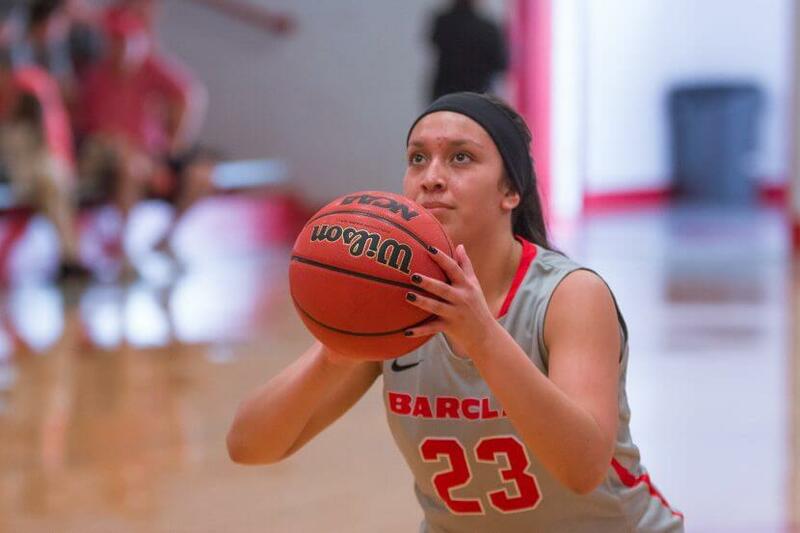 Barclay College’s Carrasco earned a spot as All- Conference Honorable Mention. The athletic combo guard averaged 8.4 points, 7.4 rebounds, 3.7 assists, and 2.6 steals for the Lady Bears this year. Next up for the Lady Bears is a date with Dallas Christian College in the NCCAA Southwest Region tournament on Thursday at 2 pm.